Liu Shan can draw two, give one of the cards to any other player. Then both characters are flipped. When Liu Shan is damaged, he can flip his card. He then does a judgment. If it is a diamond, the damage is negated. Either way, Liu Shan keeps the judgment. 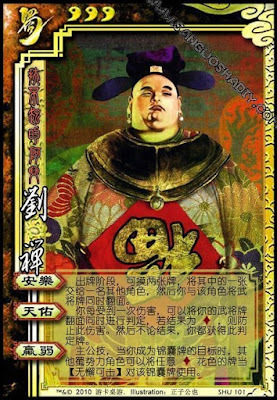 King Ability: If Liu Shan is targeted with a tool card, any other member of Shu can use a diamond for a negate. If Liu Shan is already flipped and does "Protect", then he re-flips and returns back to normal.